KUKA Roboter GmbH is regarded as one of the world's leading suppliers of industrial robots. Its core competencies lie in the development and production of industrial robots, controllers and software. 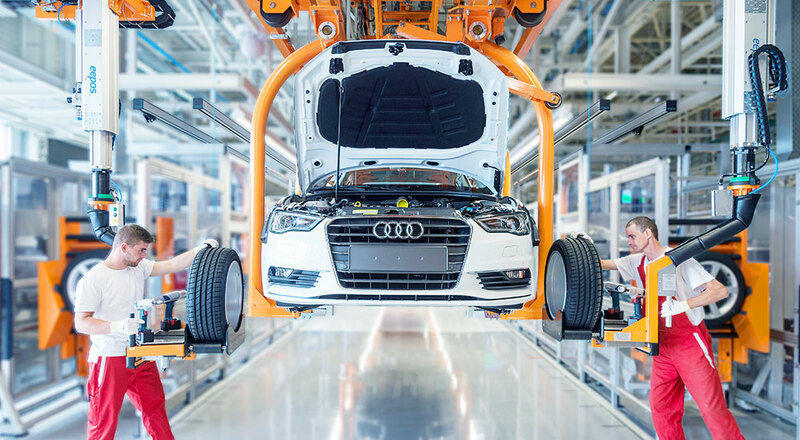 When manufacturing robots, KUKA relies on the cooperation between man and machine. And support from eepos aluminum crane systems. 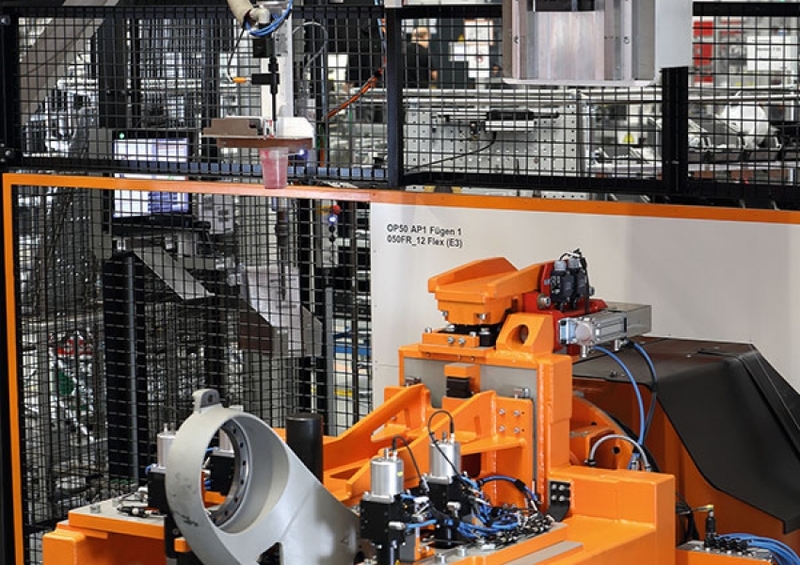 The orange KUKA robots are regarded as a very efficient and powerful solution within a production line. They enable recurring tasks to be performed quickly and precisely at a consistently high level of quality. 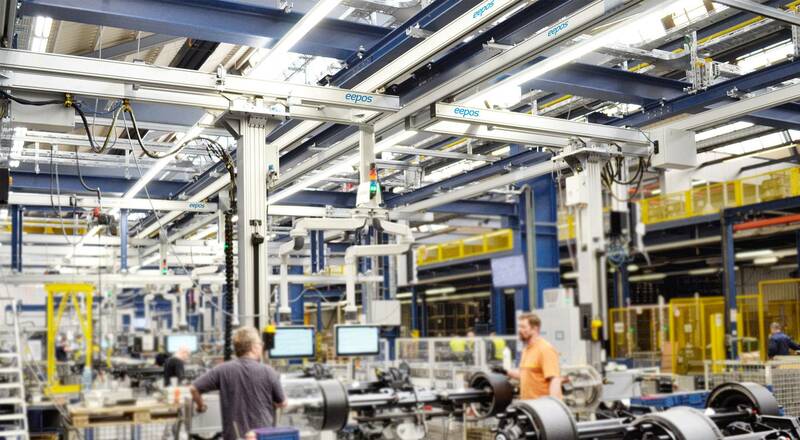 It goes without saying, therefore, that KUKA uses all the resources at its Augsburg headquarters to set up its own production line and also uses its own solutions for its own production. 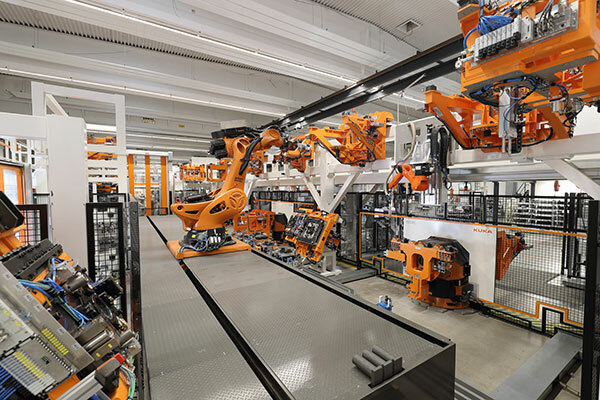 Edmund Bahr, Head of Production at KUKA Roboter GmbH, formulates the objective as follows: "Our main goal above all was and is always the optimum workstation - integrated into the modern industrial 4.0 environment. Of course, we also use our robots for this in our production. Here on the main line, we manufacture over 150 different variants in the payload range from 6 kg to 500 kg. 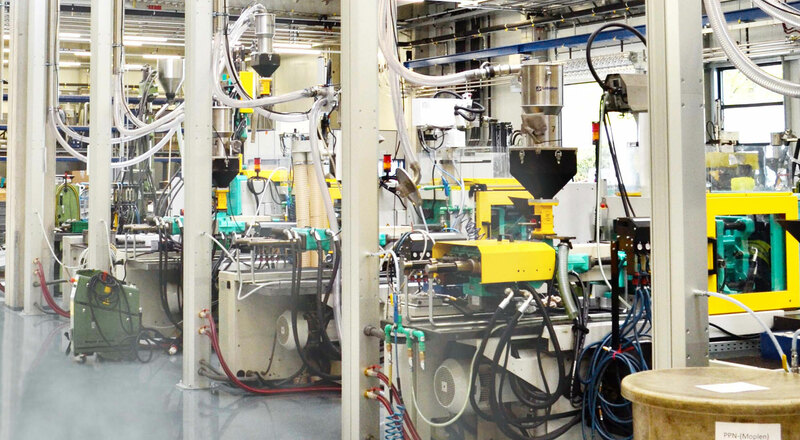 In addition, we continuously improve and optimize our products and processes. That's why we need great flexibility, which we can realize through the cooperation between man and machine." 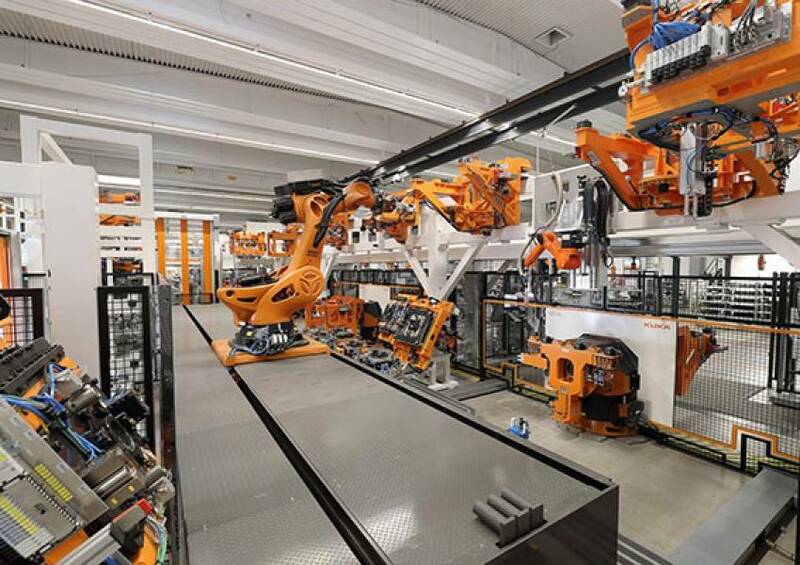 In the cell, which is separated from the rest of the line by a protective space, a KUKA KR titan from the heavy-duty class successively moves the base frame, gear and carousel for various robots, inserting them into different clamping devices. 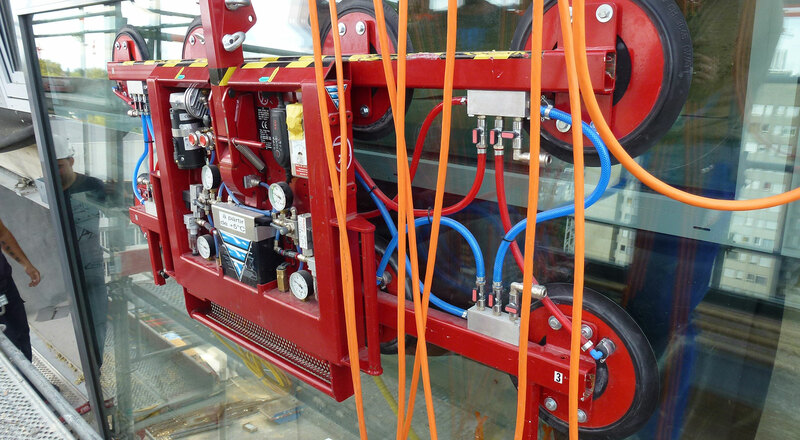 In addition, various small parts are assembled and applied at an adhesive station using a KR Agilus sealant. After this automated assembly, the KR titan takes the assembly of axis 1 and places it on a carriage. 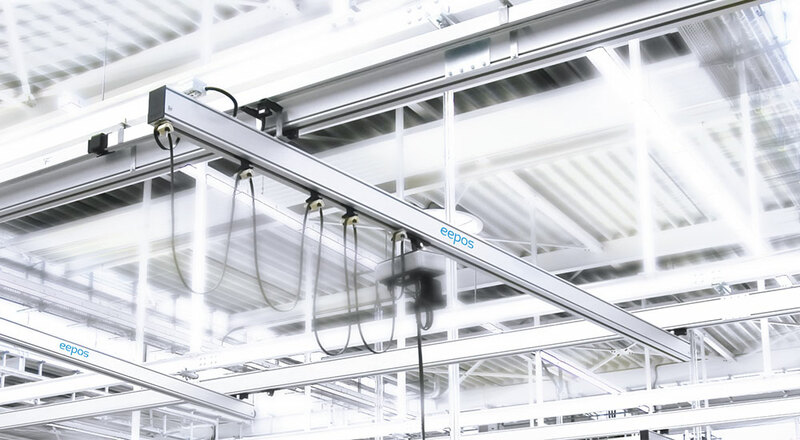 KUKA employees work at ergonomically optimized workplaces with the eepos one crane systems in several stations where the screws are screwed. 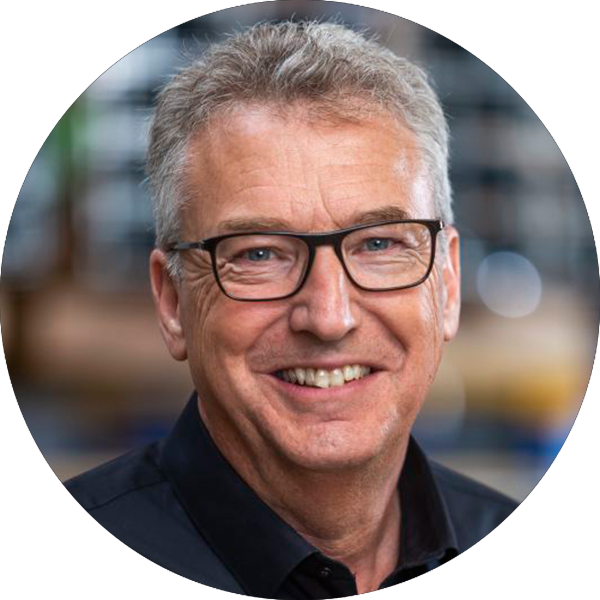 Edmund Bahr explains the decision in favor of this partial automation: "We have an unbelievable variety of variants for our robots and, in addition, continuous improvements in the product lines, so that we have decided to make conscious use of our employees and their flexibility here. 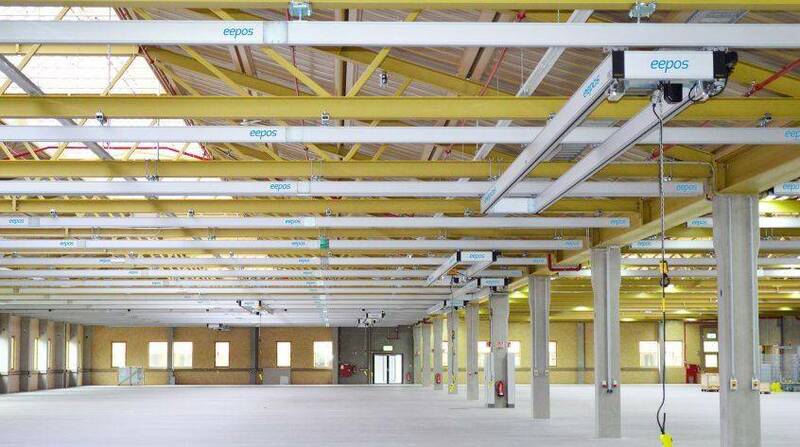 The screwdrivers are suspended from the eepos cranes for better ergonomics and safety. Otherwise, we would also have had to automate the screw feed. It's simply not worth it." 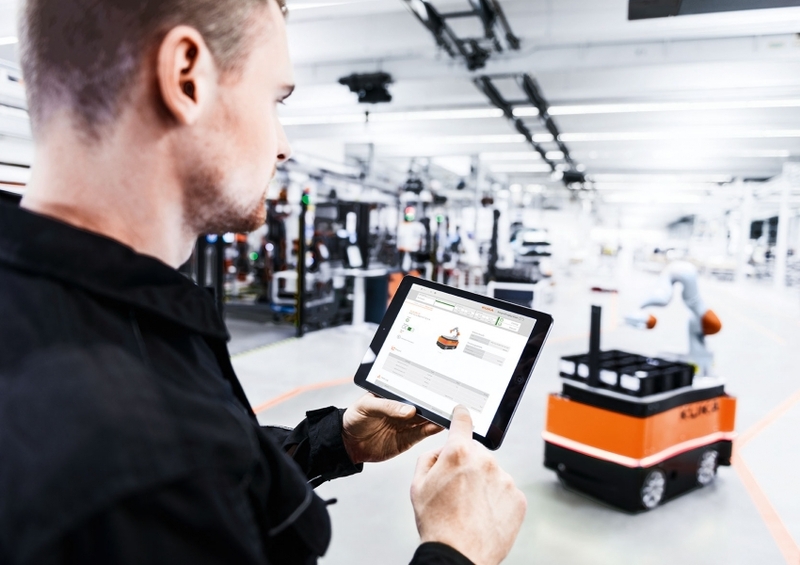 With regard to the digital connection to the cloud-based software platform KUKA Connect, Bahr adds: "The robots and screwdriver controllers fulfill everything that is imagined under Industrial 4.0. They receive their orders via the internal system and are self-registering with quality control, logging and acknowledgement. This means that the relevant information for each assembly step and the equipment used is always completely available in the KUKA cloud." Automation only as far as it pays off and as far as it makes sense. 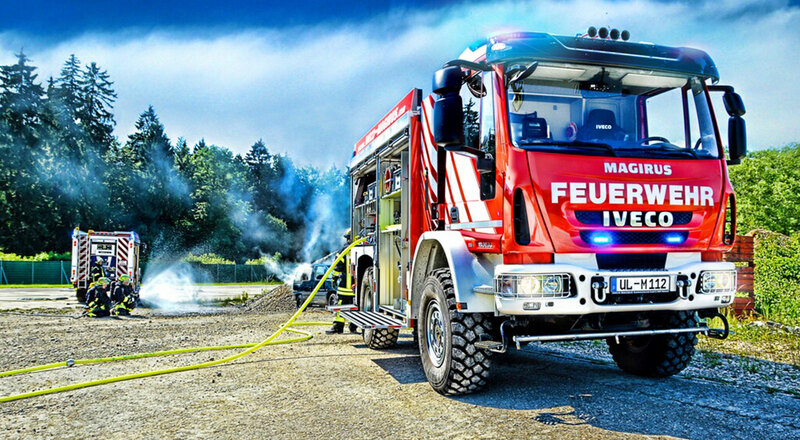 Automation wherever heavyweights and hazardous substances are involved or where it pays off for reasons of occupational safety, process safety or cost-effectiveness. 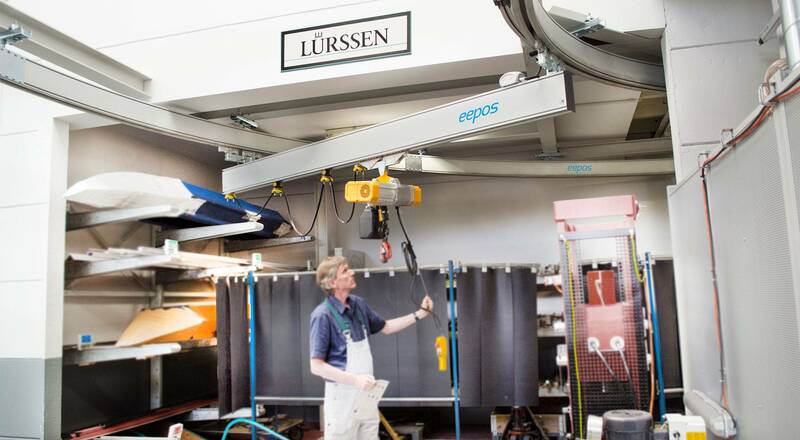 For the further assembly of the robots, Edmund Bahr opted for the aluminium crane systems from eepos because he was convinced by the entire concept of the modular crane system: "The variety of eepos components and the clarity and consistency of the systems give us the flexibility we need here in production. 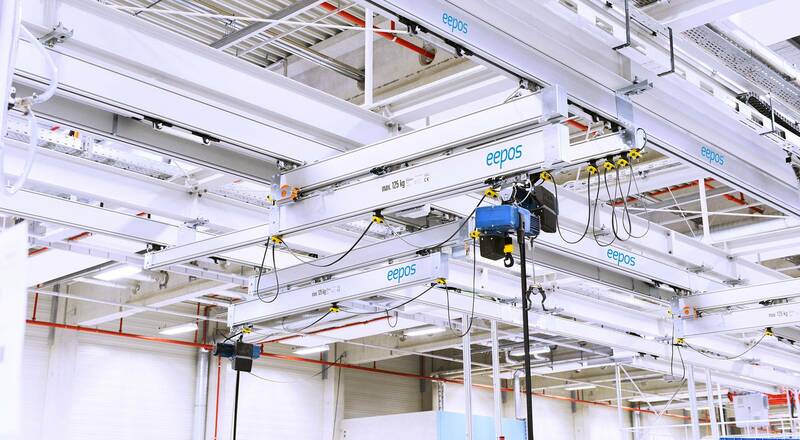 The eepos crane profiles with the item grooves, the mounting options, the jacks and the service stations have given us a lot of freedom in our planning. In addition, additions and conversions can be implemented quickly and easily. 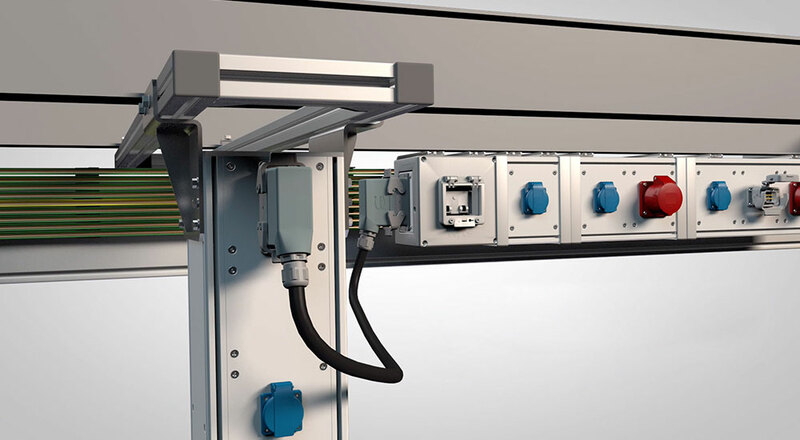 All employees appreciate the lightness of the crane systems and the smooth running of the systems at their workstations. 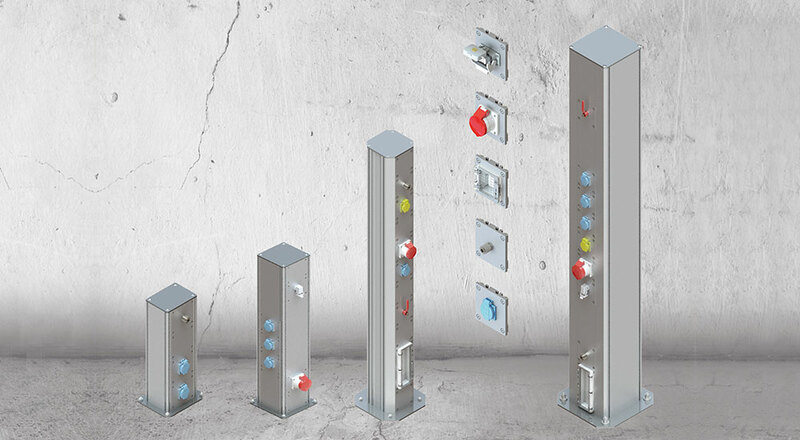 We are enthusiastic about the large selection of the eepos modular system. The cost-benefit calculation convinced us with both the area crane and the slewing crane. The feedback from the employees was consistently very good. We would do this again and again." 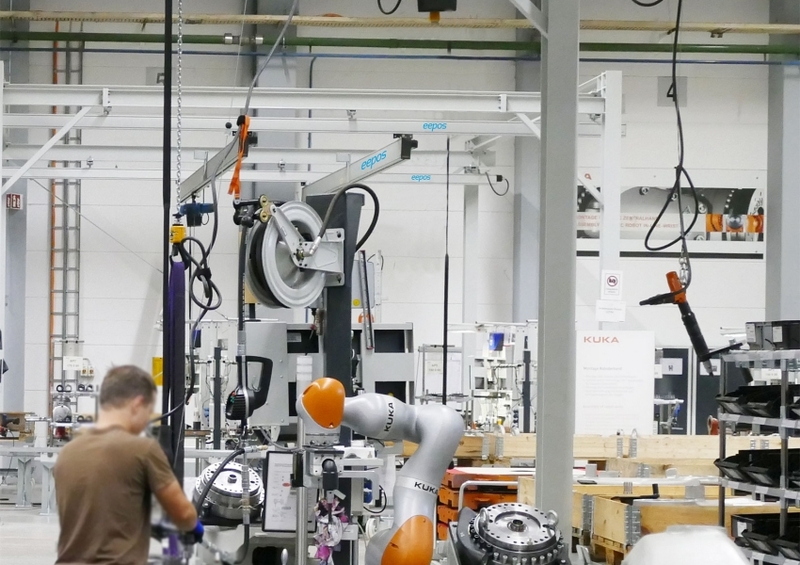 Just how innovative KUKA is can be seen in the individual stages of production. 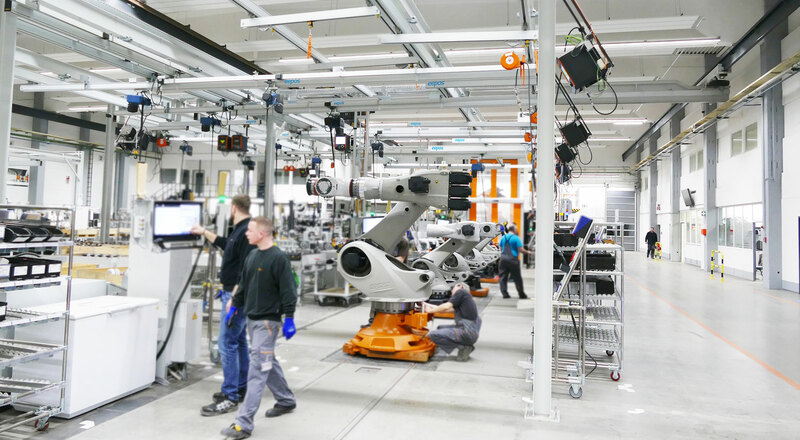 KUKA employees, the MRK-capable lightweight robot LBR iiwa and eepos Kransysteme work together on screwdriving processes during assembly. 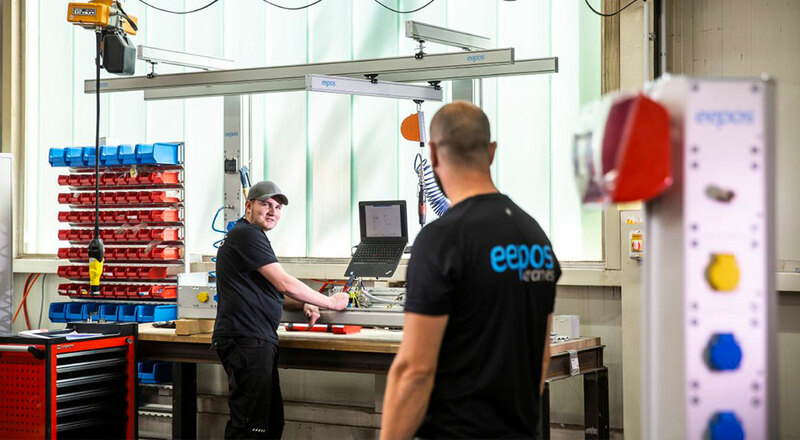 Edmund Bahr's experience is consistently positive: "The handling of parts and screwdriving systems can be carried out very easily with the eepos crane system and thus relieves the employee of positioning and holding. The LBR iiwa screws the individual components together with the worker to form the assembly. The lightweight robot complies with all safety regulations that are relevant for collaborative systems. If the employee touches the robot arm, it stops immediately. In addition, complete monitoring by the KUKA controller takes place, and everything is passed on high to the corresponding systems." 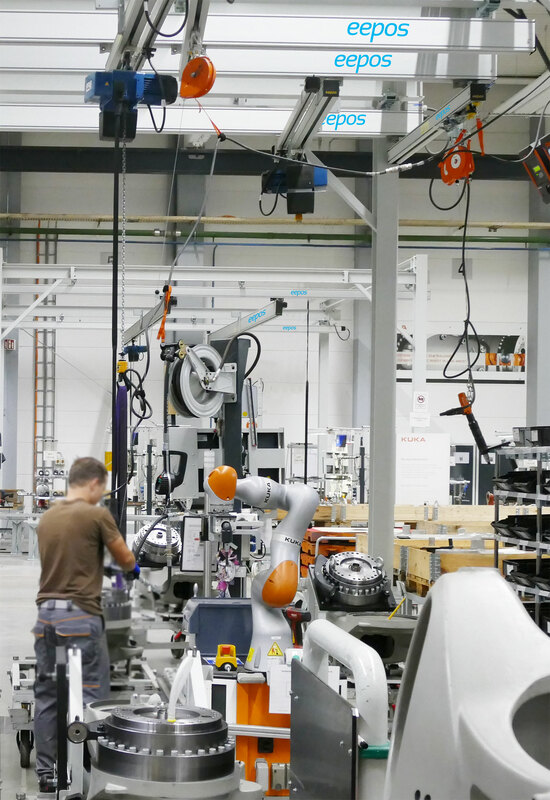 With the implementation of human-robot collaboration, KUKA has become a pioneer in "Manufacturing Industry 4.0": completely networked and integrated hardware and software structures for KUKA tools that are based on the flexibility of aluminum crane systems and floor conveyor systems. 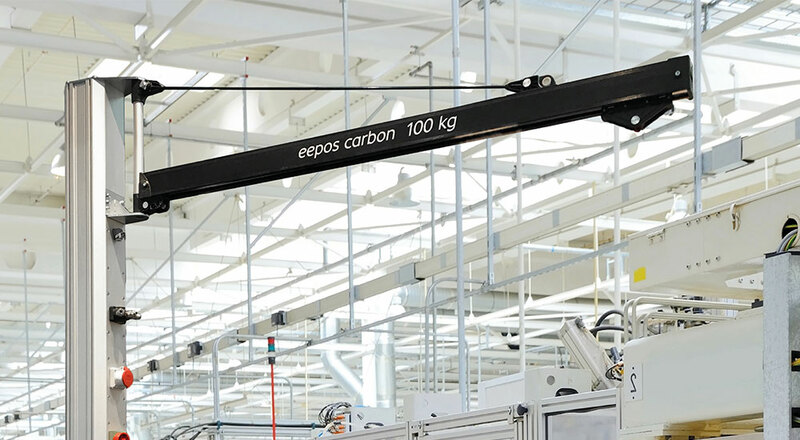 Friedhelm Mücher, Managing Director of eepos GmbH, sees this as decisive for the future of production in Germany: "The cooperation between crane systems and robots is only just beginning. Conventional tools will increase their productivity many times over with robots, and cranes will make a decisive contribution to this".